i've always said that when i'm too old to hike i'd give golf a try. since i can't hike at the moment -- maybe i'll take up golf and rent those neat little carts to get around in and try to stay in shape. You don't even have to carry your clubs, you could buy this Segway robot to follow you around. that looks like fun -- but where do ya put the ice chest? If Daly is your role model, you definitely will need the ice chest. 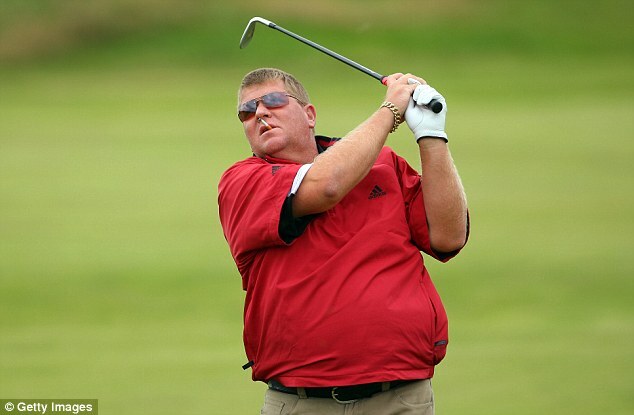 I assume that is John Daly. When he does something good Arkansans claim him. When he does some of the other stuff he is famous for, some say you know he did go to high school in Missouri. i have no idea what's going on in this picture. i posted earlier about turning down free tickets to the masters. but if i had to go to a golf tourney -- i'd follow daly around. i think he just might make it interesting. something tells me this is photoshopped -- but john daly and kid rock eatin fruit loops?! -- i wanna believe this! I think mr. fun pants is wearin' a wire so his spotter can tell him what hole the hotdog girl is on. The post was edited 1 time, last by Socks ( Oct 14th 2017, 3:05pm ). The truth is that advice was never meant for you...so true! So I go to my 35 HS reunion golf outing (I played horrible, shot a 113) and I come home with this little beauty for my troubles, I guess I pulled my hamstring when winding up, never had a bruise this big before...this ever happen to anyone? I’m fallin’ apart at the seems. Never had a bruise like that from pulling a muscle. But unfortunately can relate to falling apart at the seams. yep, got one like that waterskiing a few years ago, hamstring also. crazy, this things the size of a softball. Sure you didn’t get hit by an errant shot? Maybe one of the birdies I hit followed me home and snuck up on me whilst I slept. Either that or I really did get abducted by aliens. but yes RICE. Truth be told I didn’t do a thing with it. lekki is missing a great opportunity. Beautiful looking coarse with all its Azalea’s...Reed and Spieth tied at 14 McIlroy in the hunt, and Rickie Fowler comin’ on strong. Patrick Reed wins the green jacket! i'm glad that POS tiger doesn't have a prayer of passing jack. I don’t think he’ll ever come back to the way he played when younger, could care less, never been a big Tiger fan. Early in his career, I followed him because I met his Dad. Tortoise Wife and I attended the BMW Championship on Friday. Our first live PGA event. We watched TV coverage of the Thursday round and came up with a decent strategy to get a closeup view of the players. I'm not a Tiger fanboy but I think I got a pretty good picture on the #6 teebox. A surprise was seeing Woodstock Vermont's own Keegan Bradley putting together a nice round. Justin Rose quietly put together a solid 18 holes. And Jordan Spieth dug himself a deep hole. He'll need a spectacular day today to make the 30-man cut for the Championship tournament in Atlanta. Ended the day in the BMW Owner's Pavilion overlooking the 17th green. They accepted the key from my $4500 used 14 year old BMW motorcycle as proof that I was worthy of admission. my golfing friends think i'm crazy, but once upon a time i turned down free tickets to the masters. one of my friends got the company tickets -- his dad owned the company. On #15, Tiger flat-out chunked his 2nd shot. The gallery groaned and Tiger hung his head as his ball came up well short of the green. When I got home and watched the TV coverage, the commentator said "Tiger chose to lay up with his 2nd shot." Don't get me started on the Tiger Woods roving gallery. Bunch of ignorant jagoffs idolizing a guy because he used to win a lot. Pushing & shoving to get to the ropes on each hole, then cheering & running to the next hole as soon as Tiger makes his bogey. Well, maybe not all of us. One of the Tiger-Bots looked at it and loudly proclaimed "Oh... Tiger's in 9th place now and one of the other guys is in first." On the 13th tee, Tiger hit an iron on the short 385-yard par 4. The same Tiger-Bot informed the gallery that it must be a par 3 because Tiger hit an iron. Someone corrected her that it was actually a par 4 but she refused to believe it. After all, if Tiger hits an iron, it absolutely MUST be a par 3 hole. Trail Days.... here I come! !